The second time. 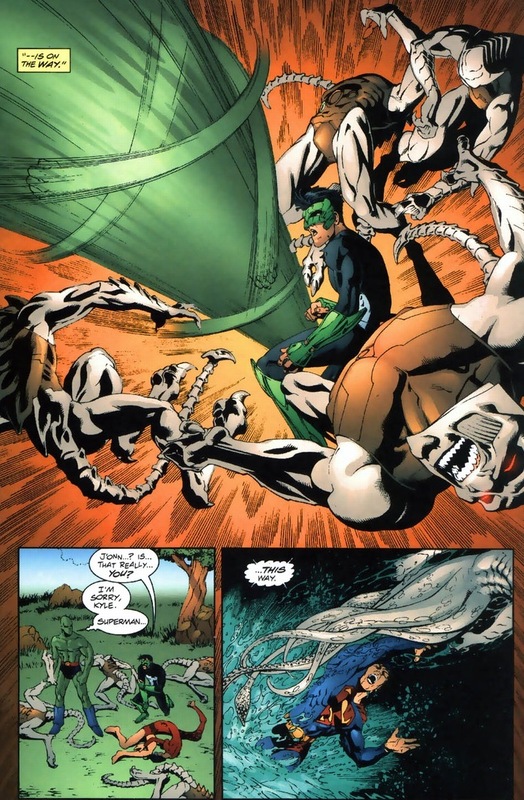 The first time the JLA battles the White Martians borders on legendary. 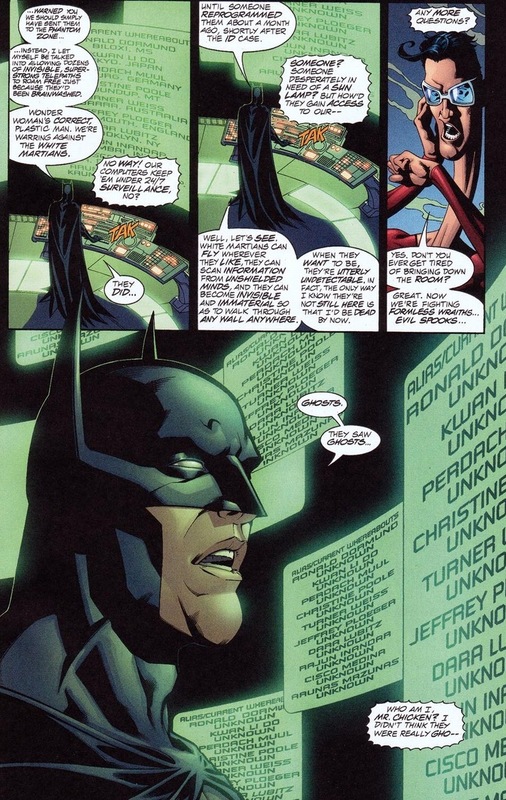 Batman, a match, gasoline, etc. But they come back. They always come back — status quo and whatnot. 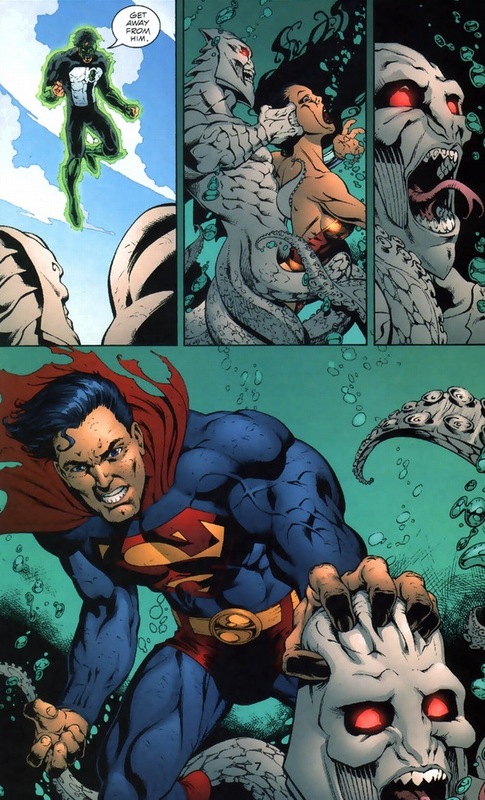 So today we’ll start round two against the extraterrestrial menace, if just because the ending justifies everything I’ve been saying about DC heroes for years. It’s amazing. 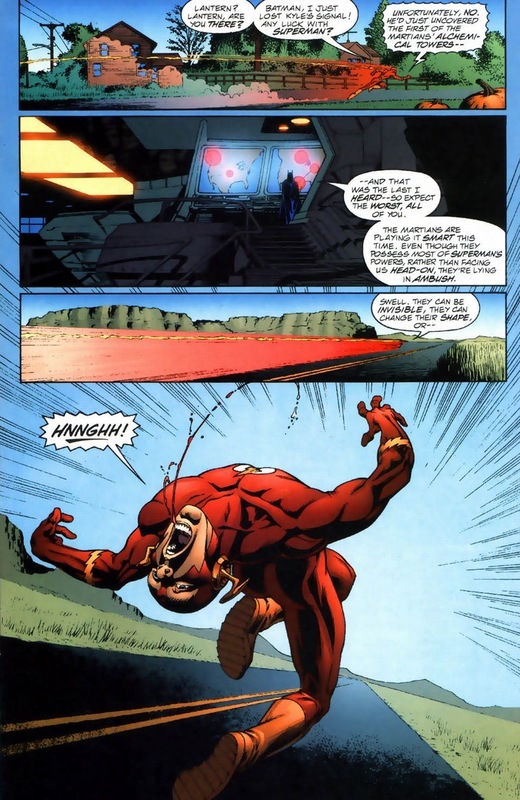 But that’s for Wednesday, as today’ll be all the intros, blood, violence, and drama you expect from JLA #55-58, written by Mark Waid and drawn by Bryan Hitch & Mike Miller. How about some ominous gooey set up? A bunch of weird stuff happens that I’m not showing you. 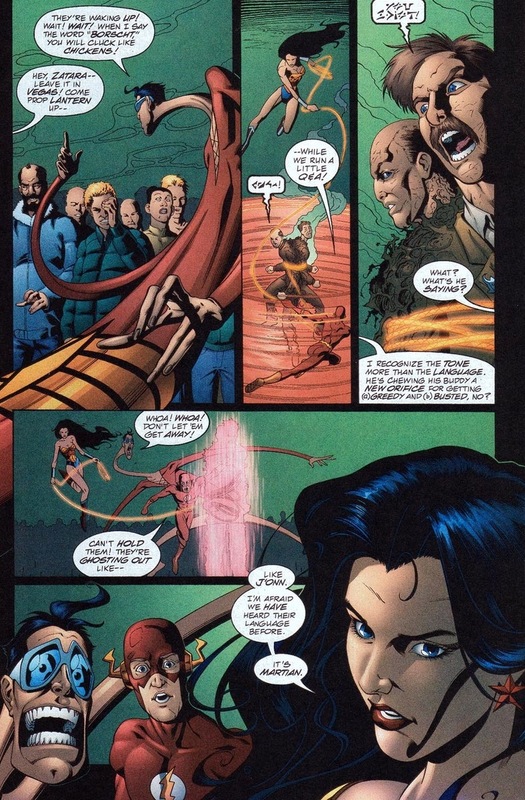 People go crazy, including Lois Lane, Nightwing, and other JLA love interests. Finally, it culminates in a nuclear explosion. 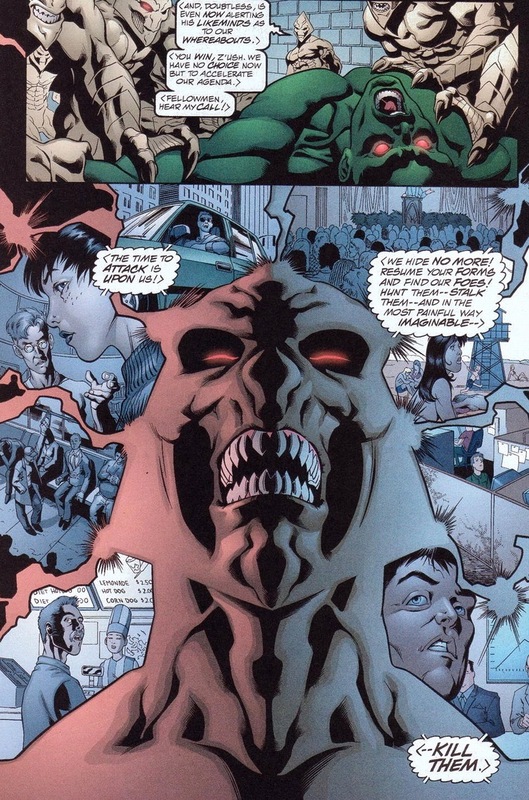 As our dear heroes (who at least half could probably survive an atomic blast head on) protect the exploded city, the true culprits show their face. I mean, sort of, the best shapeshifters can show their face. 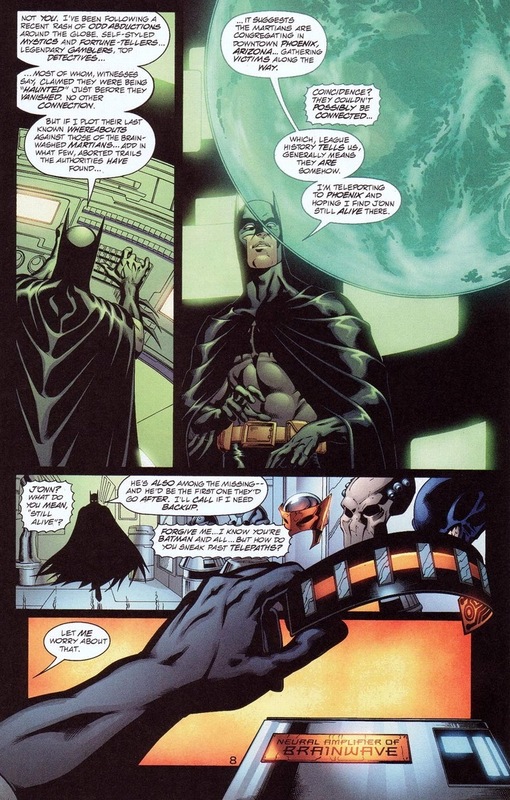 Want to hear Batman talk science for a few pages? Of course you do. 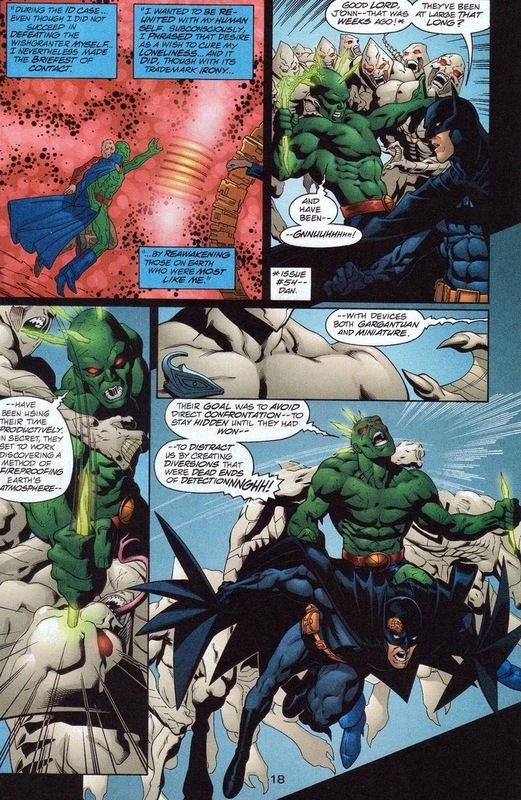 I’d like to believe Batman could take out all the White Martians in a straight fight. 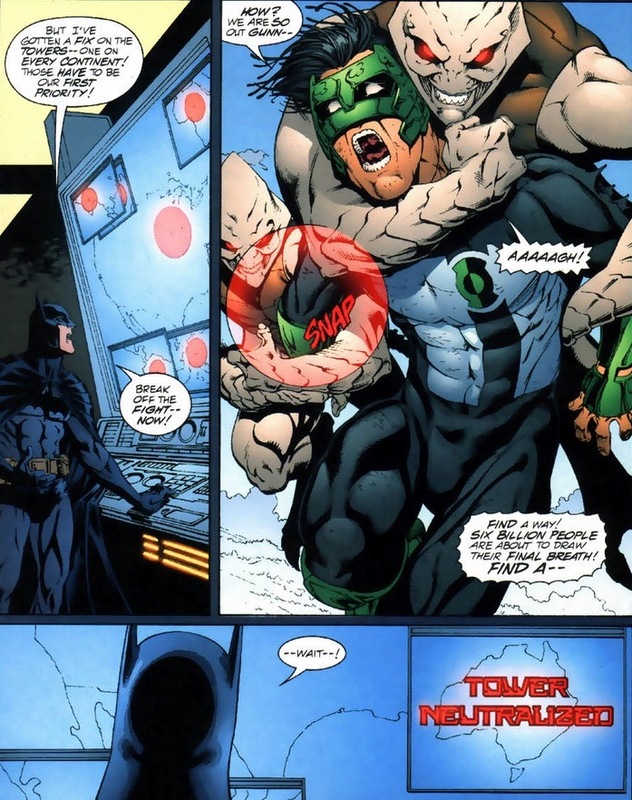 But even with his utility belt stocked full of deus ex machina, Batman can’t possibly defeat a dozen beings of Superman-esque power attacking all at once. Eleven, maybe, but definitely not a full dozen. Still, it won’t be lacking for dramatics. 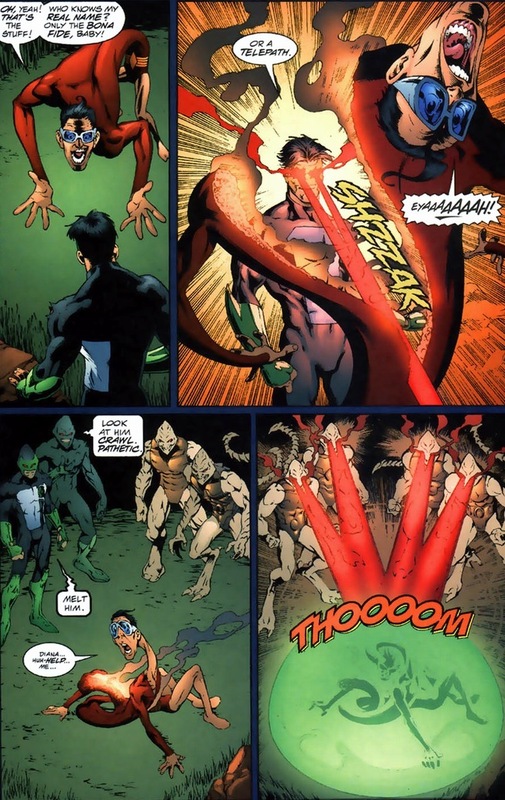 Poor J’onn. His desire to make some new friends has pretty much set a course to destroy his adopted home. But wait, you shout. Why don’t our superheroes just carry a few matchbooks and save the world that way? Y’see, the White Martians learn from their errors. Due to nanotechnology or a magic raygun or a Galactus crossover or whatever reason I skimmed over, the planet can no longer create fire. And that just doomed the world. No oxygen or something. I really should brush up on my science. 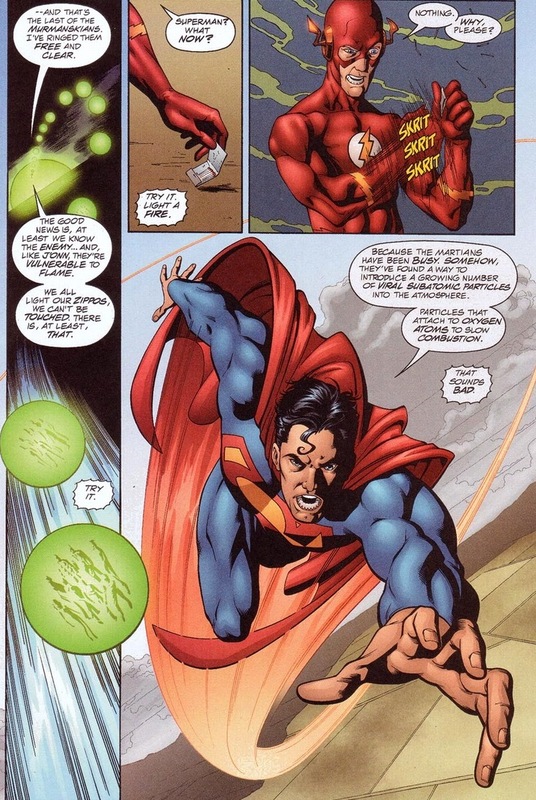 Plus, remember how the Justice League fights equal with levels of fury and teamwork? 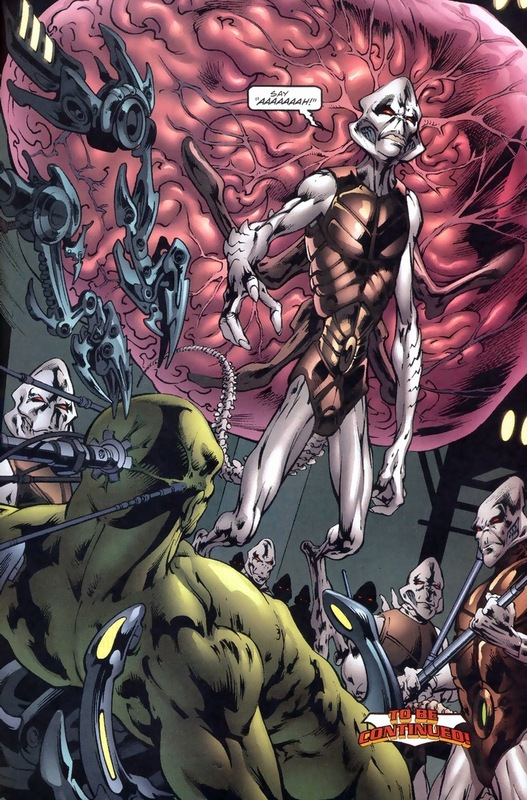 The bad guys know that too, and White Martian victory comes easily when they eliminate both their own weaknesses and then exploit their opponent’s. With the Justice League out of commission (and every other superhero busy doing other heroics), only one man can save the world now. Like say, a man who’s not really a man but who accidentally ruined his new planet by releasing dangerous bad guys because he wanted some new friends. That guy. Redemption time! 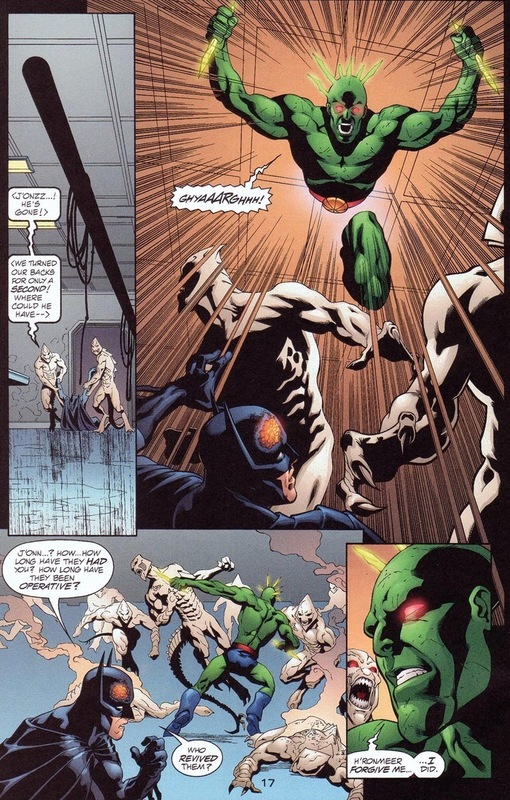 Martian Manhunter’s plan to defeat the alien threat is by far the most insane, amazing plan I’ve ever seen in superhero comics. You’ll see it Wednesday — I’m just as excited as you. 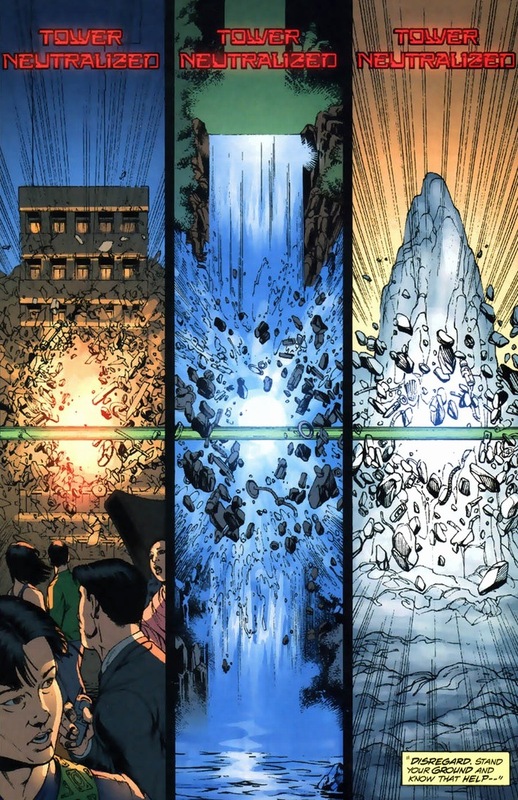 This was a great finale to Waid’s run on JLA. 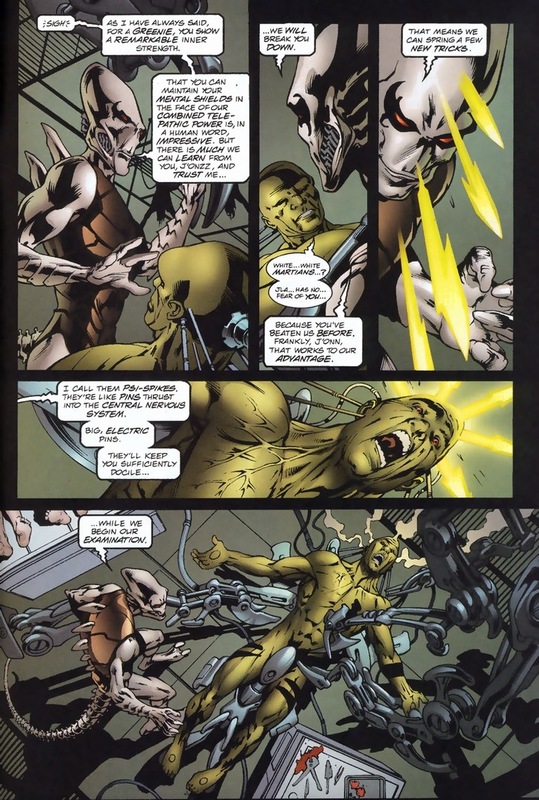 He maintained Morrison’s highest-stakes-possible, all-the-time vision of the team while avoiding Morrison’s tendency toward occasional abstruseness. (abstrusity?) 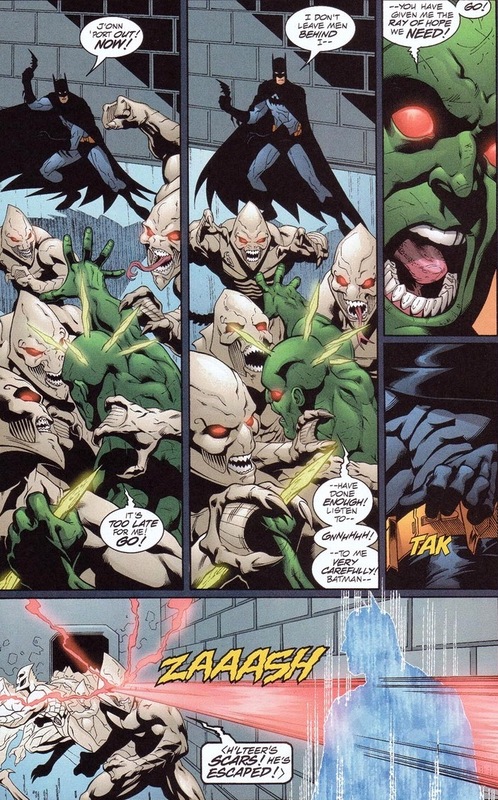 I was ridiculously pleased with myself for figuring out the meaning behind J’onn’s ‘Ray of Hope’ remark at the time.